Anyone else here enjoy packet tricks? Do you own any of the novelty packet tricks created by Paul Hallas? He's created a lot of fun ones over the years, including this new one I picked up recently, called "The Tree of Knowledge". Paul is active on The Magician's Forum from time to time, so perhaps he'll even pop around and say hello, and comment on this particular packet trick. I had mixed feelings when I first came across this packet trick. As you can tell by the title, and if you are familiar with the first few chapters of Genesis, you will have figured out that this is a reference to the story of Adam and Even in the Garden of Eden. It's a challenge to take on material like this without trivializing what is actually a very serious and important event in the Biblical narrative. But Paul Hallas knows his packet tricks, and so I was prepared to give this a second look, and I'm glad I did. If you're not familiar with Paul 's work, you really should find out more about him, especially if you enjoy packet tricks as I do. 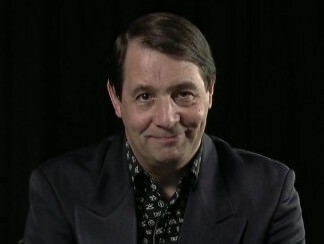 Paul is a respected authority on the subject, and has even written a number of important and successful books on the subject, such as "Small But Deadly" (2005) and its larger sequel "Still Small, Still Deadly" (2010). Also be sure to check out his youtube channel (link), where you'll see him perform a variety of packet tricks. I love variety in packet tricks, and especially when they have cute art, touch on an unusual theme, or have something that can draw people in, I'm interested. 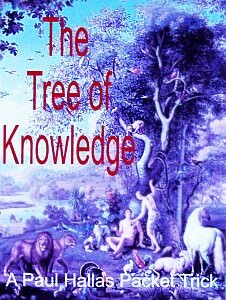 "The Tree of Knowledge" by Paul Hallas certainly has all of that. What you get are four double-sided cards in a small clear plastic sleeve, plus two double-sided pages with written instructions. So let's tell you a bit more about how it works, and what I think about it. 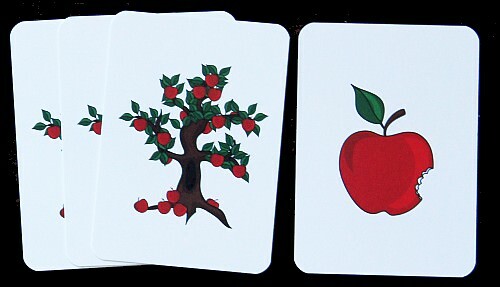 The plot of the Tree of Knowledge is straight forward: First you show four matching cards, each picturing an apple. Then you show the reverse of these four cards, each of which pictures a fruit tree. But which one is actually the Tree of Knowledge and holds the forbidden fruit? A suitably wise spectator is invited to give a number from one to four. Now when the card at that number is shown again, it turns out to have a serpent pictured besides with the tree! How could the spectator have known that this was the one? The answer is obvious when the card is turned over, because he's obviously eaten apples before: on the reverse side is an apple - surprisingly now with a bite taken out of it! All the cards are examinable. Paul has a lot of personal experience in performing magic, and that's obvious from his written work and performances. He knows the importance of the well-chosen one-liner and joke, and having clever and appropriate patter to make the magic memorable and interesting. He provides full suggestions for patter, and also gives lots of other ideas that you can use, including a number of different jokes about apples, topics like Johnny Appleseed, how an apple a day keeps the doctor away, and more. This means that there's quite a bit of material here that you can select from and use depending on your personal style, to take this particular trick in different directions for parts of your presentation. The cards are slightly larger than regular poker sized cards, and this helps emphasize the bright colours and simple graphics. They have a smooth finish, and they slide over each other cleanly and smoothly, so I had no issues at all with the handling. They are also quite thick and stiff, so they feel durable, and the colours are vibrant and cheerful. All this gives it a different feel from your usual Bicycle card, but like the impression it gives of something that feels like a quality item. If you've been to magic school with Mr Elmsley and know how to count, then you'll easily catch on to the moves needed to perform this. Some variations on the standard count are needed, but it's fairly straight forward and no other sleights are required. You basically need to do two counts, and then be familiar with four ways of revealing the special card, depending on what number your spectator picks. Paul does go over how to do the necessary count if you're entirely unfamiliar with it, and even offers some useful tips about how to execute it. I would recommend that complete newbies supplement this written instruction with some online videos, but for the average magician that has already mastered the fundamentals of card magic, it's all very simple. Once you've spent 10-20 minutes going over the instructions and doing a few dry runs, you can pretty much perform this. In the final credits, Paul acknowledges that like many modern packet tricks, this routine is indebted to packet tricks that have gone before it, especially the many that were explored in the 1970s. The Tree of Knowledge owes a debt in particular to a Juan Tamariz routine marketed in England in the 1970s under the name "The Tamariz Rabbit". The moves used here can be used to make anything appear or disappear on a fourth card, so it is actually a versatile routine that can have application in a lot of other ways. One other nice thing I like about this routines is that you end completely clean, and all the cards are examinable. I've long been a fan of packet tricks, and while I enjoy performing effects with standard playing cards, I do like the appeal of novelty cards, because they bring a whole new element to the table that you simply can't do with a traditional deck. Colourful cards like this are attention grabbing, and give you good scope for a story-line that connects with the images on the cards. Like many packet tricks, it's quite easy to perform, with only one main sleight - one which typically most magicians have long mastered anyway. It's not the kind of trick that draws gasps of complete astonishment, but it is cute, fun, and has a couple of moments of surprise, and it certainly entertains due to the amusing story and pictures. The theme won't suit everyone, and I do think that care is needed with the patter to avoid being irreverent. But those who do enjoy unusual packet tricks or like the idea of some card magic that is very different from what we usually see, should certainly consider this and Paul's other work. Where to get it? It's been a while since "The Tree of Knowledge" first appeared on the market. Probably the best way to obtain it is to contact Paul himself via his personal website at paulhallas.com or via private message on these forums. The cost is US$10, which includes postage within the USA. If this kind of packet trick appeals to you, do check out his other work, and the many fine contributions he's made to the packet trick genre, including his Ultimate Card Trick Collection.